An earnest money deposit is a check that's handed over with an offer to purchase a home. It's a "good faith" deposit, showing that the buyer is serious about buying a home and is ready to move forward with the purchase. There's no set amount for an earnest money deposit. It can range from $100 to 10 percent of the sales price, though, traditionally, it's about 1 or 2 percent of the purchase price―enough to show that the buyer has some skin in the game. So on a $250,000 home, you're looking at an earnest money deposit of around $2,500. Buyers' agents will try to minimize the earnest money deposit a buyer puts down. For sellers, however, bigger is definitely better. The buyer stands to lose the earnest money deposit if they pull out of the deal, so laying down a large chunk of cash shows that the buyer is fully committed to buying the home, financially tied to the property, and not looking at other homes for sale. In multiple offer situations, the seller is likely to go with the buyer who puts down the largest earnest deposit, as it is a sign that the buyer is serious about closing the deal. What Happens to the Earnest Money Deposit? When a buyer wishes to make an offer on a home, he makes the earnest money deposit check out to the seller's agent or the title agent, and delivers the check along with the offer. The seller's agent or title company takes the earnest money deposit check and deposits it into an escrow account. Most states have laws requiring the check to be deposited within a few days of the contract being ratified, that is, accepted by both the buyer and the seller. The check sits in escrow until the deal goes into settlement. 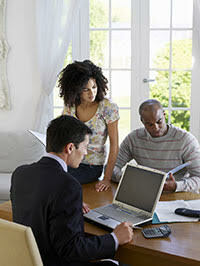 At closing, the earnest money deposit gets applied to the buyer's down payment or to his closing costs. What Happens If There Is a Disagreement? If the sale does not close for legitimate reasons, the buyer will get his earnest money deposit back. This most commonly happens when the contract contains a home inspection contingency, and the home inspection throws up repair issues that the buyer and the seller are unable to resolve. However, if a buyer voids a contract simply because he changes his mind, or he violates the conditions of the contract, the buyer will forfeit his earnest money deposit. Earnest Money Deposit and Contract Contingencies. The more contingencies a home offer contains, the weaker it appears in the eyes of the seller regardless of the amount of earnest money deposit the buyer puts down. That's because contingencies give the buyer a legitimate "out." If the buyer cannot fulfill a contingency, he can walk away from the deal and still get his earnest money deposit back.